Free market economy depends on re-investing profit and dividends back into capital costs of new or continuing enterprises, and with the departure of mercantilism and gold, silver or other mineral backed currency. Mercantilism was the norm of the dominant economies of Western Europe from 1500's till the around the First World War which is the beginning of use of fiat currency that allows nation-states to print paper currency and set the value or manipulate the value of currency while managing inflation through monetary policy independent of the value of rare metals that was central to national economies prior. Why mention these archaic economic terms in relation to 5 year old cryptocurrency, BitCoin? 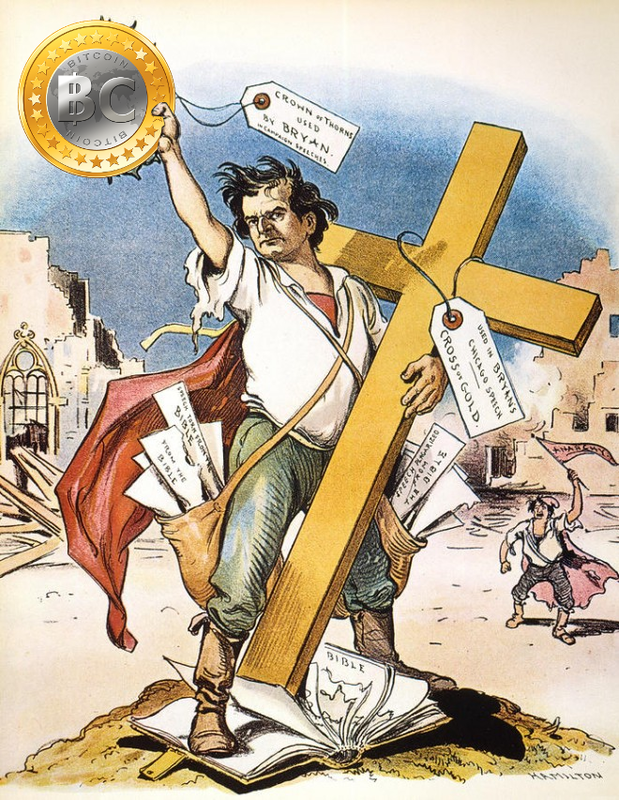 Because BitCoin proselytizers often cite the alternative currency as benefitting the economy by assuring the that no nation or corporation or regulatory body could increase the money supply because it relies on peer-to-peer network and is limited by math of cryptography, so BitCoin currency is incapable of inflation inducing monetary or any monetary policy since it is regulated by the algorithm in an open source network that can be audited, checked, and double-checked by those that are coders; the end results is that removing inflation (at least monetary policy created via inflation) from our economy incentivizes accumulation of currency and removes the disincentive of being inflation-ed-out of wealth and encouraging that wealth back into the market to chase the greatest return on investment. BitCoin, like the absolutist monarchs at the height of mercantilism, seeking out the greatest accumulation of currency rather than the best and most efficient use of limited resources. I will acknowledge that our current monetary system is overly reliant on state involvement and subject to corruption, as well as intrinsically tied to infinite growth within a world with limited resources-- so it is obvious that there needs to be reforms, it is just that BitCoin isn't anything new or something that humanity has not already tried. So last week's announcement by Circle to offer BitCoin exchange and banking services sans fees for withdrawing or depositing BitCoins as every other BitCoin exchange does as a means to turn a profit should not be considered as anything other than warmed over the common practice of the 18th century of mints of the European monarchs that provided the service of coinage free of charge to ensure that the gold and silver would be minted and accumulated within their borders. Though the concept of competition between the BitCoin exchanges mirror the competition between the egos of the monarchs is an inelegant analogy, they both share a truth that the economic purpose of these currencies are devoid of benefitting the real economy. Mercantilism encouraged an excessive amount of resources to be deployed to conquer and maintain global colonies without providing direct benefit to the mother country other than bragging rights; BitCoin is able to remove state-induced inflation but does not improve purchasing power of the individuals whom use the currency but actually could cause a downward pressure on the income of labor and stagnate the economy as it benefits savings far greater than our current economic paradigm. The motivating factor to promoting this new mercantilism is that if you have inherited wealth and little income from wages from a job, then there is all the incentive in the world for you to return to mercantilism and stop the slow slide of inflation that may force the wealthy to be entrepreneurial like their ancestors or (G-d forbid it) seek out employment like the vast majority of the economy. Trading gold bullion, a favorite hobby of those believing doomsday is coming and those that identify themselves as "real 'Mericans", assume that since gold is tradable and currently has high value compared to inflationary fiat currencies then when 's##t hits the fan' they will be all ready to barter and continue participating in the economy as a post-apocalyptical consumers; what they fail to realize is that if 's##t hits the fan' day ever comes then only resources that are essential to life will have any value and gold and doubly so crypto currencies will be valueless. These doomsday preppers and survivalists make up the vocal minority of those calling to get rid of fiat currency, but their voices are amplified by those with accumulated fortunes who seek to retain those fortunes for their progeny without lifting a finger-- in essence a return to Gilded Age where labor was cheap and the uber-wealthy were like living gods. Powerful and wealthy individuals express these latent desires by hiring a small conclave of private investigators to tail Eliot Spitzer because Spitzer rattled Wall Street's cage as Ken Langone did, or compare the trials and tribulations of the most comfortable and wealthiest in world history to that of the Jews in Nazi Germany as Tom Perkins did, or prophesied that gold would reach $5,000 an ounce (when it actually took a drubbing to below $1,000) and that their are some people that deserve to be paid $2 hour such as those with mental disabilities as expressed by Peter Schiff, or to mint his own silver coinage with his face on them like David Koch did in his failed campaign for Vice President on the Libertarian ticket. The fact that the survivalists have bought into the malarkey that the uber-wealthy have sold them as viable economic and public policy demonstrates exactly how duplicitous the new mercantilists are. If the argument is being made that due to rampant government spending that devalues the American dollar will lead to a collapse, but that can be avoided if we end deficit spending and stop taxing the uber wealthy while only tax wages from employment (thereby taxing only the income the uber-wealthy avoid), while the same argument states even if they are unsuccessful the gold coins being sold to them by hucksters like Glenn Beck and Alex Jones will still hold their value even after the collapse is detached from reality and wholly wrongheaded. But this shell game does have the benefit that having a critical mass of duped voters that can show up to rallies demanding to give tax breaks to those that couldn't use it except to become morbidly wealthy, cut government services that are essential to themselves ("Get rid of social security-- because private charity will take care of me when I'm old! "), and stop regulators from enforcing environmental and financial laws because they like reading by the light of the burning cuyahoga river and swindled out of their homes by auto-penned eviction notices. A crowd of old white people is 'great optics' for the elected officials that have already been bought and paid for by those that want to see greater economic disparity even if that is delivered in means made verboten by both Ayn Rand Objectivists and Austrian School of Economics. We could have an income ceiling that would still exorbitantly high allowing a very luxurious living, but not so high that any individual could jerry rig the economy and the government in their favor, it would essential to include all types of income for all legal individuals to be treated the same (until the Supreme Court changes their opinion would be inclusive to corporations and other fictitious legal entities)-- say $30 million a year. Those that currently earn more than that a year wouldn't be de-incentivized as they would basically be 'Brewster Millions' every year, and whatever opportunities they gave up beyond that income cap would certainly be picked up by someone that hadn't made hit the income ceiling yet spreading the wealth while retaining some aspect of economic meritocracy. But this is of course a non-starter, for the individuals that currently earn a billion dollars a year or more make up the 700 individuals that hit contribution limits in the 2012 Federal elections, which have been removed with the SCOTUS McCutcheon decision and that along with the disembowelling of the McCain-Feingold legislation allowed dark money into our elections have certainly transformed our democratic implements in November into vestigial afterthoughts of the auctions that occurred long before the ballots for the primaries were even printed. So lets all get ready to make the heady decision, shall we be crucified by gold or BitCoin? The mass shooting yesterday at near Santa Barbara City College by Elliot Rodger has sadly become far too common place in America. The number of victims may vacillate and location may differ with each incident (Fort Hood aside) but it tends to be some one that is mentally unbalanced that has easy access to firearms that leads to same tragedy multiple violent deaths. This shooting has it's unique attribute that the shooter premeditated the abomination that he had been planning and posted a YouTube video describing his "rationale" of the horrors he had planned to commence later that day. After watching it I came away with these two thoughts: 1) shooting spree is vastly disproportionate response to being a 22 year old virgin 2) his sporadic laughter in the video, if it was intended to provide him with the utmost creepiness factor-- he succeeded even though it seemed forced and hammy. Unlike the bizarre text-based videos of Gabby Giffords shooter Jared Loughner, Rodger's videos seemed more like over-the-top emo teenager than someone that was going to commit mass murder. After watching a couple of Rodger's videos I would have assumed that he would be likely to put on some bad one-man show that just had him moping about his non-existent love life while traipsing on stage wearing black pants and and black turtle neck... which ironically might have been a successful strategy to getting his 1st girlfriend that might have been deluded he was deep and artistic.